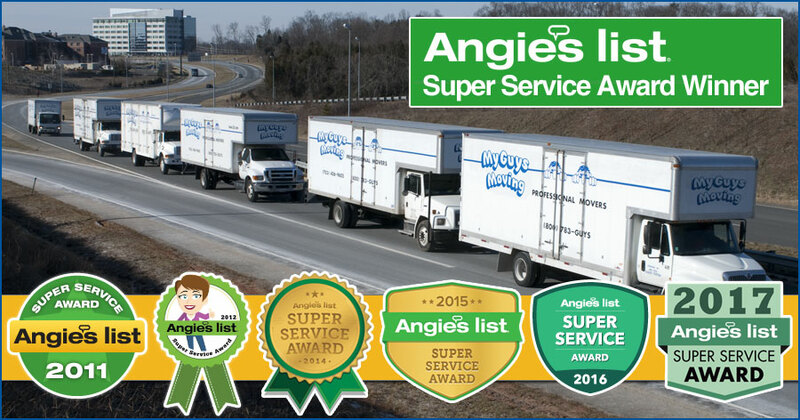 Angie’s List Super Service Award: Six Years Running! Sterling, VA, January 2018 – My Guys Moving & Storage is proud to announce that it has earned the home service industry’s coveted Angie’s List Super Service Award (SSA). This award honors service professionals who have maintained exceptional service ratings and reviews on Angie’s List in 2017. About My Guys Moving & Storage – Fully Licensed, Bonded and Insured Member of American Moving and Storage Association (AMSA), Providing Packing & Unpacking Services, Local Moving, Long Distance Moving, Corporate Relocation, Commercial & Office Moving Services, Assembling Services, Furniture Moving, Large and Heavy Item Moving, Piano Moving, Senior Moving Services, Short- and Long-term Storage Services, and Moving Boxes & Packing Materials.